Every morning I take a short walk to pick up my newspaper. It makes me feel a part of the country to read a Hebrew newspaper, and it helps to improve my Hebrew. Today I read about Putin announcing his plan to withdraw his troops from Syria. I read about a plan to turn over most security in Jericho and Ramallah to the Palestinian Authority, which the Prime Minister says never got off the ground. And I read about the development of a system to locate and destroy Hamas’ attack tunnels near the border with Gaza. That last was especially good news. Then I got to page 9 (Hebrew link). Moshe Cohen went up to the Torah for his bar mitzvah today in a synagogue in Ma’ale Adumim. Moshe’s father, Tzvika, was not there. 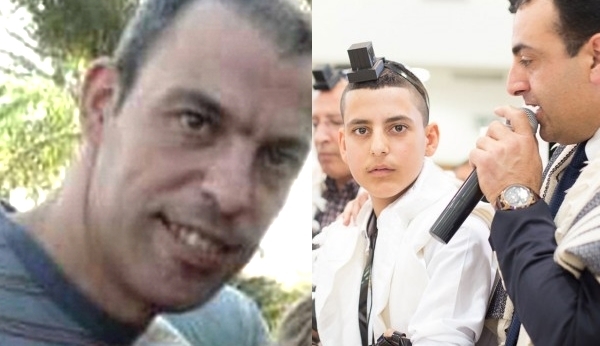 He was in Hadassah hospital in Jerusalem, anesthetized and on a respirator as he has been since Saadi Ali Abu Hammad, who worked with Tzvika at the mall and who drank coffee together with Tzvika, lay in wait for him and brutally attacked him with an ax. The security camera video, which I am not linking here, shows the terrorist striking him over and over again as he tries to get up. The extreme viciousness of the attack was shocking. Abu Hammad gave himself up and was arrested. The Palestinian Authority, with the help of Iran, will pay him a salary while he is in prison. The family cancelled a party that they had planned for Moshe, but did not ask to postpone his aliyah. And now for the part that is almost impossible to write. After the Bar Mitzvah, Moshe went to the hospital to visit his father. Tzvika’s doctors have tried to wean him off the respirator with no success. He has not responded to attempts to wake him or communicate with him. I would like to write that a miracle happened and that when Moshe called to his father and told him that he was bar mitzvah, he smiled or even moved his finger. But he didn’t. Moshe kept trying until he broke down in tears.